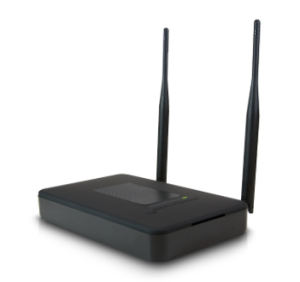 If you live in a large home, or have problems connecting wirelessly to your Airport Extreme base station (or any other base station) because of dead spots, walls, or other obstructions, you may want to consider a “Repeater” that will extend the range of your Wi-Fi signal. I would be the first to admit that I have been stumped by various network issues, set up problems, and other things “Wi-Fi.” There is some mystery and black magic to this stuff and I am reluctant to even update the firmware on my Apple Extreme Base station (APE). For example: last year when I tried to update the firmware on my APE the unit would not return to the land of the living. I had one week left on the Apple warranty and Apple did replace the unit. So when our illustrious MyMac Editor extraordinaire, John Nemerovski, asked me to review this unit, it was with extreme trepidation that I agreed to do so. However, after all was said and done, this was pretty easy. If I could do it, so can you. There are lots of technical “geek speak” details I could share about the amped device, but for most of us, they won’t mean very much so I am going to try and keep that to a minimum. To prepare for this review I read, and highly recommend, Take Control of your Wireless Network by Glenn Fleishman and published by the good folks at Tidbits. In the amped wireless box you will find detailed printed instructions and a CD that contains the same set of instructions in PDF format plus a video that walks you through the entire set up process. I strongly recommend that you read those instructions and watch the video before you attempt to set up the Repeater. 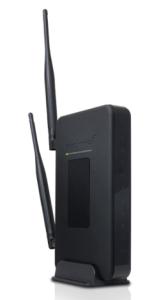 The High Power Wireless-N 600mW Gigabit Dual Band Range Extender expands the range of any 802.11a/b/g/n wireless network by repeating the signal (2.4GHz and 5.0GHz) from a wireless router and redistributing it in a new “extended” location. In a nutshell, the Repeater expands the range of your wifi network. However, this Repeater does provide more than just that. The Repeater measures 6” x 4” wide and can be used sitting flat, standing upright, or even mounted to a wall. A stand is provided to use the Repeater upright. The two high gain, detachable, dual band antennas come uninstalled in the box, but it is easy to attach them. There is a power cord in the box as well as an Ethernet cable. Once you plug the unit into a power outlet, the unit powers up as there is no on/off switch. There are three lights on the front of the unit. One indicates power on, the next LED indicates a connection to a 5.0 GHz network while the last LED lights up when connected to a 2.4 GHz network. The rear of the unit has five Gigabit ethernet ports and will act as a hub allowing you to plug in wired devices. This is very handy when you don’t have a hard wired ethernet connection nearby and devices that can not connect wirelessly. There is also a USB port that allows you to connect a drive to use on your network. More on this feature later. You really need to read the included instructions and watch the video before you begin. Positioning the Repeater in the right spot is the key to good repeatability of your current signal. If you do this incorrectly, you could end up repeating a lousy signal which really defeats the whole purpose. You will position the unit somewhere between your APE and your dead zone where the Repeater is receiving at least a 70% signal. The way I determined this was by using my MacBook Air and amp wireless’s website where you’ll find their “Smart Set Up” feature available via a web page. It did take some time, and trial and error, to figure out where to place the unit. I am still not convinced I have set this up in the best possible location. I think you will have to try a few places to see what might work best for you. Naturally, the whole point of using this Repeater is to expand your current wireless network into “dead zones” you may have because of range and obstruction issues. Between the video, the web page, and the printed instructions it was fairly easy to get the Repeater up and working but it does take some time to fine tune. Let’s talk a little bit about the characteristics of Wi-Fi. Looking at 802.11n speeds and distance. A 5.0 GHz connection is faster than a 2.4 GHz connection but the distance they can travel is farther with the 2.4 GHz network. The 5.0GHz band has some other characteristics that help make it, I think, a more preferable band to use. I noticed, while taking some before and after readings, that while my 5th generation APE offers dual band connections, most all of my devices are connected to the 2.4 GHz band. I am not sure why that is. According to Apple your APE “chooses the best connection” to your device. I think I could set up a separate 5.0GHz network using my APE, something I will have to try at another time. I connected to the Repeater’s 5.0 GHz network and fired up Safari. The browser did seem faster to me, but what did the numbers tell me? My first thought was to fill this article with tech stuff like “RSSI” (Received Signal Strength Indicator) and “MCS” (Modulation and coding Scheme) but as I researched further I could see there is some disagreement as to what spec is the best indicator of a decent Wi-Fi signal. After more research it seemed to me that the “Signal to Noise Ratio” (SNR) was an important factor. Here is a description of SNR in an Apple Support document. I created an Excel spreadsheet and went about the task of measuring and recording/calculating my SNR in different rooms in my house. The afore mentioned Apple Support document explains how to get the readings from your Mac. While I was receiving a fairly solid 2.4 GHz signal, the faster 5 GHz signal was low. However, once connected to the amped wireless repeater the readings for both bands was in the “Excellent” range. The repeater allowed me to connect to the faster 5 GHz band, something I was unable to do before. Using the Safari browser was a faster experience when connected to the amped 5 GHz network. E-mail was noticeably faster as well. One of the biggest advantages are the wired ports on the back of the unit. After you connect, this Repeater becomes an ethernet hub. I was able to plug an Apple TV and a Samsung TV into the ethernet ports which made setting both devices up very easy and also I did not have to utilize their internal wifi functionality. The downside? The unit is very lightweight. At first I had the unit sitting in a stand vertically. However, when I plugged an ethernet cable into the top port the unit fell over. Try as I might, adding ethernet cables to the unit caused it to fall over and onto the floor. I finally decided to just leave it sitting flat. Even then, the ethernet cables tended to pull the unit off the table. The SR200000G has a single USB port on the back of the unit. You can use this port to connect a hard drive or USB thumb drive and connect to that drive on your AMPED network. I connected a Windows formatted USB drive, launched the set up web page, and using the USB storage option, was able to set up the drive. After that I was able to “see” the drive within my network tab under “shared” and mount the drive. Seemed easy enough, so I tried a regular flash based hard drive. Could not connect. Then I tried a Mac formatted hard drive enclosure and once again I could not connect. Try as I might, I could not not connect to any drive other than the thumb drive. After messing around with this for a few hours I finally relented and contacted amped support. An interesting note: amped Tech Support is available, by phone, all weekend long. I called and after a short wait I explained what I was trying to accomplish. The tech support person explained that while you can plug any type of drive you’d like into the USB port, it will only recognize drives formatted in Windows FAT16, FAT32, or NTFS format, and then, only up to 2TBs. (This reviewer did not have the windows specified hard drive needed to fully test this function). I asked if I would be able to mount Mac (HFS) formatted hard drives connected via my APE and he said I should because the Repeater does act as a pass through. I was having sporadic luck with this and he suggested I might need to “flash” the unit’s firmware with the latest version, which I did. However, this does wipe the unit clean and you have to set it up all over again. Once I completed setting up the Repeater once again I tried to connect to my APE connected drives and found that I could connect, but my ability to connect was a bit erratic at times. This was an interesting experience. After reading up about Wi-Fi and looking at how my house is set up, I’m not sure I ever really thought about the positioning of my APE, or noticed the lousy speed I was getting when I was in areas farthest from my APE. I am now considering some changes in positioning for my APE, and positioning is what Wi-Fi seems to be all about. Minor changes to the position of the two antennas on the Repeater yielded very different results when trying to gauge signal strength during set up. In the box the purchaser will find detailed printed instructions and a CD that contains the same set of instructions in PDF format plus a video that walks you through the entire set up process. I strongly recommend that you read those instructions and watch the video before you attempt to set up the Repeater.